Three days ago, my Blogging Weight Loss Challenge against Jonathan Volk finally came to a conclusion. While it ran for a full 10 weeks, the time sped by and both Jonathan and I found ourselves scrambling during the final 24 hours to try to make the weight. I’ll spare any build-up to my final result and tell you right now that I was able to lose that last pound and make my goal weight of 195. The night before I was actually up late watching The Curious Case of Benjamin Button and decided to eat a second full Vietnamese meal. That late night meal actually made me gain 3 pounds overnight and so in the morning I was faced with having to lose 4 pounds! More on that in a bit. Jonathan Volk was in a similar situation and had around 4 more pounds to lose as well, and he also just managed to just barely make the final weigh-in. While I was a bit surprised, it wasn’t too shocking. I had always thought that both he and I would make this challenge from the beginning. Internet entrepreneurs, or entrepreneurs in general tend to be very goal-oriented and will often do whatever it takes to reach their goals. I had been planning for the past couple weeks that I would do my longest stretch at Westwood Lake on the final day as it always seems to cut a lot of weight. So, in the afternoon I went out and did a full 14KM (8.7 miles) going as fast I could for the first 6 and comfortably walking the final 8. Fortunately, it wasn’t as hot as it had been recently which made things easier. When I got home, I immediately weighed to discover that I had lost 4 pounds! That put me at 195 pounds, my goal. However, just to be safe, I didn’t eat or drink anything for several hours and did my official weigh-in then. I know that this isn’t healthy or even too safe, and wouldn’t recommend it, but I really didn’t want to screw up on my final weigh-in. In my official final weigh-in video below you’ll notice that I’m not wearing socks. I had forgotten that I wore socks in my original weigh-in video which is why you don’t see them here. For any people concerned that my socks could add more weight, please note that my actual beginning weight was 206, not 205 (you can check the video) which should more than make up for the sockless feet. I just said 205 to make the number easier. 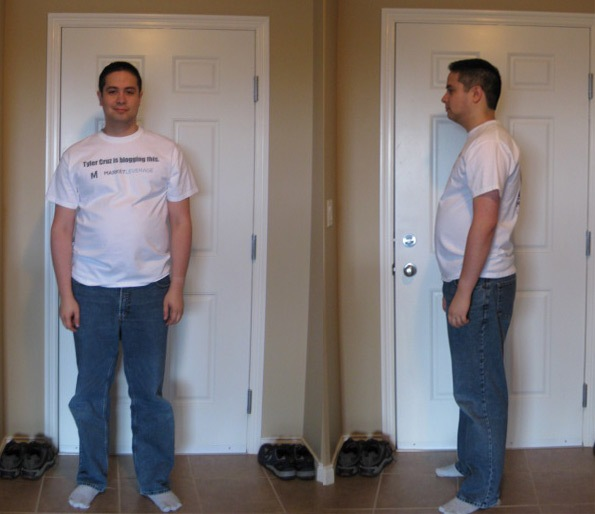 As with any weight loss challenge, here are my before and after photos. I wore the same shirt and pants (but forgot about the socks again). I look pretty much identical between them, but I didn’t expect to see any visual change with a loss of only 10 pounds (4.8% of my starting weight). 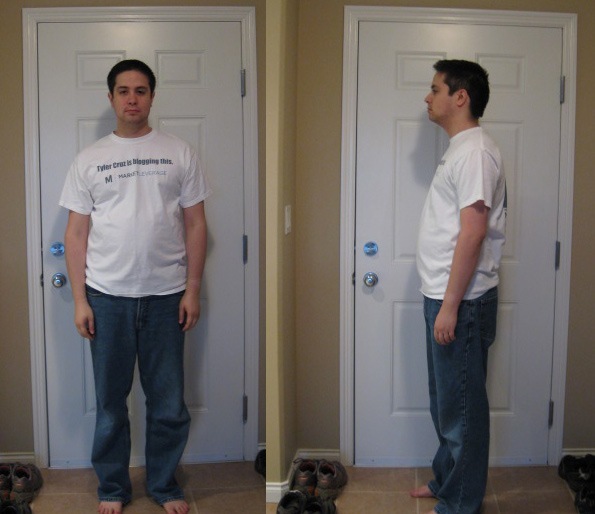 Although… if you compare my side portrait photos, you might be able to notice a very slight change; my shirt seems to fall a bit more naturally in the after photo whereas it clings and molds around my belly a bit more in the first photo. I think if I lost another 10 pounds that there’d be quite a noticeable change. I’d like to thank Jonathan Volk for participating with me in this challenge – the friendly rivalry definitely helped motivate me. I’d also like to thank MarketLeverage for sponsoring my shoes, and thank those readers who were kind enough to send me encouraging comments. Now that this challenge is over, I actually have another challenge in the works (money related) that I plan to start around the middle of July, once I get back from my vacation, so be on the lookout for that as it should be awesome. If you look carefully in the before picture, you can see your wallet in your left back pocket that isn’t there in the after photo. I’m only kidding. Good job Tyler. Now, for the real feat… try keeping that weight off! No more Vietnamese meals for you my friend, hehe. I once lost 16lbs in just under 3 weeks. Then I went on vacation to Disneyland and gained it all back. Hopefully the same thing doesn’t happen to you on your vacation. Honestly, I expect to regain 5 pounds, but I think that the other 5 will stay off due to a slightly increased daily workout routine and better awareness of what I’m eating. You’re right. Awareness of what you’re eating is one of the most important things. Even if you slide back a little, once you expand your awareness you never go back. Don’t hold back man, say what you really think! That’s nothing, one of my good friends calls me a fat f#$k, and I think it’s funny. Guys can get away with stuff like that. If a woman said that to a friend, that’s it – friendship over. Tyler I think you did an incredible job. Its tough to lose weight, tough to exercise routinely, and even tougher to give up certain foods. I think that now you will be able to keep it off, because you have learned quite a bit about nutrition and fitness, and hopefully you will stay motivated. I don’t know… the before Tyler had a smile on his face and socks. The after Tyler had a frown and ate said socks. Increase your muscle mass and it wont matter what you eat. It’s about time, man you had a good blog until you started this weight loss thing that no one really cares about. Post about your ppc campaigns, post about your income from sites, site stats, idea, whatever, I was getting so sick of these weight loss posts. Weight loss is big business. Sometimes you need to expand and extend content to keep it fresh. Good job. Losing 10 pounds can be very tough for people. Are you going to try and lose a little more weight or stay where you are? What did you think of Benjamin Button? I enjoyed it, although I could definitely see a million parallels between it and Forrest Gump, which makes sense since it was adapted for the screen by the same writer. Congrats, I knew you could do it! Now we can start sponsoring the fun stuff (like dinner) again. This was the most pointless challenge ever, and the fact that you had to lose 4lbs in the final day is a complete joke. 4lbs is nothing, and everytime you eat a large meal and weigh yourself after you’ll have put on a few more pounds until it is digested. You’re not actually losing weight in the way you’ve measured things, you’re merely shifting the weight around so the scales look good. This blog used to be a fairly interesting read. This latest escapade has been a complete waste of time for everyone, Tyler himself, no doubt. Well, although I was not going to use quite the same tone, I was thinking close to the same thing. This was no challenge, losing 10 pounds in 60 days for someone who is 40 pounds overweight is easy. You should be standing in that picture with no shirt on showing off your abs, not trying to fight off eating two dinners on the last day. That is just lazy. Now having a personal post or challenge can be a nice read, but not when it is an insult to people actually trying to lose weight. You might as well had a gain weight challenge, that might have been a little interesting. Perhaps it’s time to get back to some regular content? Congrats on losing the weight Tyler. Good luck keeping it off! Good stuff, I can see that your clothes are fitting a bit looser there. Hope you keep at it and keep active! Haha! Tyler, how can you feel sleepy when you are running? I tend to hover at 195-196 pounds myself, at 5’11”, so I’m a little on the chubby side. Despite not being a web entrepreneur, I dabble a little in web design, web content writing and screenwriting (with a web series being planned for Autumn ’10). And I’m setting up my portfolio website as we speak, with a blog attached. So if you’re (or anyone else is) interested in another little 10lb challenge, I’d take you up on it. I’d just have to think what I’d put up if I lose, considering I’m unemployed and have no real savings :-p maybe a free WordPress theme or a cameo in the web series. If you’re still going to eat that much food, you can, but as long as you exercise, you could still be healthy. Nice job! Loosing 10 pounds it’s not easy. I guess that this challenge really exhausted your powers, since in the first photo (before) you were smiling, but in the second photo (after) you were a little bit tired.